Pairing the right wines and the right foods together is extremely difficult, even for the experts. And even though some pairings are practically common sense, there are still others that are difficult to match up. For example, fish tends to pair well with light wines, like Pinot Grigio, whereas steak tends to pair well with darker wines, like Pinot Noir. When you start getting into the pairings for particular herbs, specific spices, certain fruits and vegetables, and any dairy products, it gets tricky. But yet again, that’s what I’m here for. I found the right resources, the right charts, and the right bits of advice, and I’ve meshed them all together to create your ultimate pairing guide. 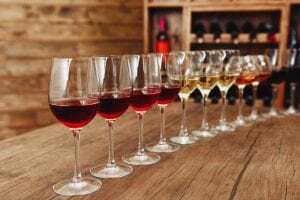 To get started, I’m going to have to explain to you the categories of wines, and I’m going to have to tell you what wines line up with what categories. I know what you’re thinking, how many wines could there possibly be? Well, the wine list is not just made up of Merlot, Zinfandel, Cabernet, Pinot, Chardonnay, Sauvignon, Champagne, Riesling, Moscato, and Port. Let’s check the categories out below. I bet you didn’t know there were THAT many wines out there. Okay, so now that you know all the names of the wines, I’m going to proceed with the guide by telling you what category of wine matches best with what particular foods. It may not make sense just yet, but read on and pay attention to the categories; You’ll understand very soon. Feel free to print it out, too. Keep in mind that when I tell you what foods go well with what wines, you are able to choose the wine from that listing. Just reference back and make your choice. Red meats like beef, lamb, and venison pair well with BOLD RED wines. Cured meats like salami, prosciutto, bresaola, and bacon pair well with both LIGHT RED and SWEET WHITE wines. Pork, such as roast, tenderloin, and pork chops, pair well with MEDIUM RED wines. Poultry, such as chicken, duck, and turkey, pair well with both LIGHT RED and RICH WHITE wines. Mollusk, such as oysters, mussels, and clams, pair well with SPARKLING wines. Raw fish and cooked fish, such as tuna, cod, trout, and bass, pair well with LIGHT WHITE wines. Lobster and shellfish, such as prawn and crab, pair well with RICH WHITE wines. Grilled or barbequed foods pair well with BOLD RED wines. Sautéed or fried foods pair well with LIGHT RED wines. Smoked foods pair well with MEDIUM RED wines. Roasted foods pair well with BOLD RED wines. Poached or steamed foods pair well with LIGHT WHITE wines. Soft cheese and cream dairy products pair well with LIGHT RED and RICH WHITE wines. Pungent cheese dairy products pair well with MEDIUM RED and DESSERT wines. Hard cheese dairy products pair well with BOLD RED wines. Alliums like onions, shallots, garlic, and scallion’s pair well with MEDIUM RED wines. Green vegetables like green beans, kale, and lettuce pair well with LIGHT WHITE wines. Root vegetables and squash, like turnip, pumpkin, and carrot, pair well with ROSE wines. Nightshades like tomatoes, eggplants, and bell peppers pair well with BOLD RED wines. Fungi like crimini and maitake pair well with MEDIUM RED, LIGHT RED and RICH WHITE wines. Nuts and seeds, like peanuts, almonds, and pecans, pair well with SWEET WHITE wines. Beans and peas, like lentils, pintos, and chickpeas, pair well with LIGHT WHITE wines. Black pepper pairs well with BOLD RED wines. Red pepper, like chipotle and chili, pair well with MEDIUM RED wines. Hot and spicy herbs and spices, like hot sauce, pair well with SWEET WHITE wines. Herbs like thyme, oregano, basil and tarragon pair well with LIGHT WHITE wines. Baking spices like cinnamon, clove, and mace pair well with DESSERT wines. Exotic and aromatic spices, like anise, turmeric, fennel, and ginger, pair well with MEDIUM RED and SWEET WHITE wines. White starches like flour, white rice, pasta, bread, and tortillas pair well with no specific wines. Choose the one that best fits your taste buds here. Whole wheat grains like quinoa, faro, and brown rice pair well with SWEET WHITE wines. Sweet starchy vegetables like sweet potato, yucca, and taro pair well with SWEET WHITE wines. Potato’s pair well with no specific wines. Choose the one that best fits your taste buds here. Fruits and berries, like strawberries, oranges, apples, and peaches, pair well with SWEET WHITE wines. Anything with vanilla and caramel pairs well with no specific wines. If you had to choose, I would suggest going towards the SWEET WHITE and DESSERT wines. Chocolate and coffee pair well with DESSERT wines. Now all you have to do is figure out what meals go best together and pair them up. 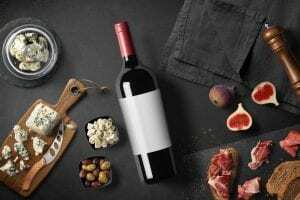 If you really want to mix foods from different categories, go ahead, and use your best judgment on what wine would pair with it according to the above advice. Have fun with it! P.S. Your lady will love if you get the pairings done right. Surprise her on your next at home date.